Analysis by Experian Automotive shows that Greater London is the country’s MPV hotspot as the area grew by 19.0 per cent during the last three months of 2008. In addition,sales of used 4WD’s in Greater London bucked the national trend and increased by 14.1 per cent during the last three months of 2008. It will be interesting to see the next set of figures as 4WD cars in particular have made a spectacular comeback nationwide in the first three months of 2009. Over all, across the country, last year used car sales fell by 8.5 per cent during October, November and December, bringing the used car sales figures for the year to 7,179,796 – down 4.9 per cent on 2007. Many predicted worse than that and the doom merchants will be scratching their heads at the sales records for all used cars being broken left, right and centre in 2009. Kirk Fletcher, Managing Director of Experian’s Automotive division, said: “The latest used car sales statistics show that despite a greater focus on smaller, more economical vehicles, the fall in sales for the used supermini and mini segments were still on a par with, for example, the upper medium and the sports segments. It indicates that even in a downturn there is a certain degree of reluctance to downgrade in size. The only thing is what they are describing is not the “current environment” and is a snapshot of the chaos that was around the used car market back in the last part of 2008. 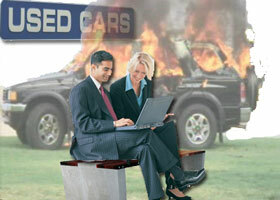 As we all now know the environment for used cars has changed beyond all recognition. I wonder if they predicted the used car sales pattern for first quarter 2009? We stand to be corrected but the answer’s probably no because we think they would be shouting it from the rooftops if they did! With gas prices declining I have noticed that there has been an up surge of used cars sold at auctions. However, with the economy still in questionable condition many auto buyers are still cautious, and many used auto dealers are not snapping up as many used vehicles to place on their lots.